It's obvious that Obama for America has a high respect for election laws. The Government Accountability Institute, a Washington watchdog group, says it’s likely a high percentage of Obama online’s donors aren’t Americans. For starters, a full 43 percent of the traffic on the site barackobama.com comes from foreign Internet provider addresses, versus just 11.9 percent at Romney’s equivalent site. GAI’s 108-page report on online campaign fund-raising at local, state, and national levels shows that many campaigns have inadequate safeguards against foreign donors influencing this election — but Obama’s stands out as a veritable cesspool. Obama’s campaign refuses to use industry-standard safeguards against online credit-card fraud. For example, some 90 percent of e-commerce companies (and Romney’s site) use Card Verification Value data, which checks those three or four numbers on the back of the credit card to make sure the card user matches the card holder. The Obama site uses it if you want to buy a T-shirt or hat — but not if you make a donation. Indeed, the moment you sign up at my.barackobama.com, you get numerous solicitations to donate. When you give, you get a thank you e-mail — even if you happen to live in Shanghai. This was a very interesting read. If you haven't already read it, you should. Most commenters that I've seen have focused in on the wage differential (and the hours that the Chinese employees work) between U.S. and Chinese workers. That wasn't, primarily, what caught my eye. Instead, it was the overwhelming difference in flexibility. One former executive described how the company relied upon a Chinese factory to revamp iPhone manufacturing just weeks before the device was due on shelves. Apple had redesigned the iPhone’s screen at the last minute, forcing an assembly line overhaul. … Within 96 hours, the plant was producing over 10,000 iPhones a day. Can you imagine a union dominated, U.S. manufacturing plant turning around assembly line processes anywhere near that quickly? Though components differ between versions, all iPhones contain hundreds of parts, an estimated 90 percent of which are manufactured abroad. Advanced semiconductors have come from Germany and Taiwan, memory from Korea and Japan, display panels and circuitry from Korea and Taiwan, chipsets from Europe and rare metals from Africa and Asia. And all of it is put together in China. 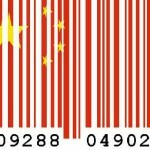 Simply put, China is a lot closer to the raw materials than America is. In many cases, it makes a lot of sense to keep the manufacturing plant close to the supply chain. How about quickly, nearly instantaneously, finding new employees to ramp up production? … Another critical advantage for Apple was that China provided engineers at a scale the United States could not match. Apple’s executives had estimated that about 8,700 industrial engineers were needed to oversee and guide the 200,000 assembly-line workers eventually involved in manufacturing iPhones. The company’s analysts had forecast it would take as long as nine months to find that many qualified engineers in the United States. … In particular, companies say they need engineers with more than high school, but not necessarily a bachelor’s degree. Americans at that skill level are hard to find, executives contend. “They’re good jobs, but the country doesn’t have enough to feed the demand,” Mr. Schmidt said. There are many, many reasons why manufacturing jobs are being created in China and not in the U.S. It's nowhere near as simple as just calling it "greed" and condemning U.S. employers. In a highly dynamic, constantly changing world, is the U.S. producing skilled employees (at all skill levels!) who are willing to quickly change what they do and how they do it? For the past two years, I've been slowly trying to figure out my opinion about U.S. foreign policy and the U.S. military. There are a lot of very bad people in the world. The thuggish mullahs of Iran and the even more thuggish dictator of North Korea jump immediately to mind. But one shouldn't forget about the thugs in Africa (Robert Mugabe and the like), the thugs in Latin America (Hugo Chavez and friends), or the thugs in Europe (Vladimir Putin). But what should the American response be? Is it our responsibility to throw them out and make the world a better place? Is it our responsibility to protect our friends (Israel, South Korea, Japan, etc) or should we only be concerned with the countries and individuals that pose a legitimate threat to our homeland? How big should the U.S. military be and how should we use it? The British at one time had a naval policy of having a fleet able to defeat the next two fleets in the world; but at that time Britain had an Empire and relied on it for a number of things. The US is not an empire, and we don't seem to be learning how to be one. The question becomes. ; how large a force does the US need to defend our legitimate foreign policy goals We already spend more on the military than the rest of the world combined. This may be excessive, depending on what we think we must do with that military. I'm not at all convinced that we need NATO now that the USSR is gone. I am not sure what good it does us to have pledges from Germany to go to war if someone attacks us. I am thoroughly unaware of why we might need the Georgian army to help us if we are invaded. I can see that our commitment to them is valuable to them, but I am not certain I understand the value to the US of the US guarantee to Germany and potentially to Georgia. I know that such guarantees are hideously expensive. And I'm inclined to make the snotty Europeans bear the cost of their own military defense. Overall, I think I favor downsizing the American military and getting out of Germany, South Korea, Japan, etc. But I'm not sure what the long term consequences of that would be. In 50 years, would we be facing a threat from a much larger and more expansionist Chinese or Russian military? It gives me pause. Update (5:39PM): Via NRO, I see that, unless things change, China may not be too worrisome in the future. China is not far behind Japan on the path to the demographic cliff edge. Fertility figures are no more dependable than any other Chinese statistics, but there seems to be general agreement that the current TFR is in the 1.7 to 1.8 range, somewhere between Sweden and Belgium in the international rankings. For China, still a poor country with a huge peasant population, this is starting to throw up problems. With the one-child policy entering its fourth decade, the typical Chinese in his prime productive years now has two elderly parents to support. Elderly, and likely penniless, since those parents left their productive years without ever having had the opportunity to accumulate much. On page 5 of my notoriously "alarmist" book, I asked, "Will China be the hyperpower of the 21st century? ", and answered no: It will get old before it's got rich. These opinions make me even more likely to take an isolationist approach. The Beijing government, for starters, has denied visas to businessmen, backpackers, and middle-aged tourists holding Olympics tickets. Moreover, the central government has also ejected long-term foreign residents and canceled) long-planned events involving foreign participants. Chinese citizens have been removed from Beijing, and many of them have been prevented from traveling there. The capital is now guarded by three rings of checkpoints and over 400,000 troops, police, and volunteers. Children cannot fly model planes, real pilots cannot quit or change their jobs, and dissidents have been forced to take "holidays." Spectators at the Games are not permitted to stand up in their seats. The only thing Chinese leaders have not done is declare martial law; but, even if they did, it's not clear that things would be much different than they are at this tense moment. The Games are supposed to be a joyous celebratory event, but the unprecedented clampdown means they have become the "No-Fun Olympics." ... Yet Beijing, in its efforts to ensure absolute security, is considering almost everything a "threat." Paramilitary police, for instance, beat two Japanese journalists in Kashgar and broke their equipment on Monday. That was an indication that the Beijing Olympic organizing committee was not serious late last month when its spokesman expressed regret for police roughing up Hong Kong reporters. The journalists were covering the chaos surrounding the sale of the last batch of Olympics tickets in Beijing and got caught up in events. There will undoubtedly be other occasions in the next few days when members of the press come up against police and other agents of the state, and the reaction of security officials will be telling. So far, it looks as if officials will continue to overreact. And if they do, we will know that Chinese officialdom, despite the supposed liberalizing influence of the Olympics, has not changed much over the years. Well, the Chinese have stopped even pretending concern for the welfare of the foreign peoples to whom they export. As if shipping potentially hazardous tires, dolls, wooden art sets, and even faulty fortune cookies wasn't enough, now they're selling people missiles. "made its largest terror sweep to date, arresting 208 al-Qaida-linked militants in six separate arrests in recent months... The ministry said members of [one] cell were planning to smuggle eight missiles into the kingdom to carry out terrorist operations, but it did not say what kind of missiles or what the targets were. [The newspaper] Okaz reported Sunday that the missiles were already inside Saudi Arabia [when they were confiscated]." A Minor Thoughts source also confirmed that lead-based paint was used to decorate the weapons. Above: A Chinese propaganda poster from 1986. No wonder Communism has appealed to so many. 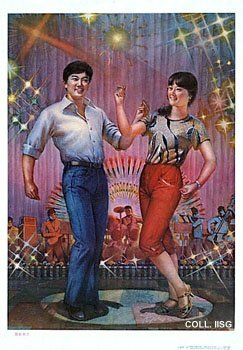 I would've called this The Communists party, but its painter named it _Youthful dance steps. _Oh well. "In the 10 years since Hong Kong's return to Chinese sovereignty, official statistics show that the number of "working poor"—defined as those who earn less than half the median income—has nearly doubled." The article itself, of course, naturally goes on to blame this 100% increase in poverty on "turbocapitalism". Which, you have to admit, is at any rate a great name, and we here at Minor Thoughts will probably be using it a lot from now on until we can finally lay claim to the word as our new domain name. So, has America been throwing our future away the past several decades? Have we been exporting all of our manufacturing capability? Are we at the mercy of China, Japan, South Korea, and Indonesia? U.S. manufacturing output reached its all time high in 2006. U.S. manufacturing revenue reached its all time high in 2006. U.S. manufacturing profits reached their all time high in 2006. Average annual compensation for U.S. manufacturing jobs is over $66,000. The U.S. manufactures 2.5 times more goods than China does. Finally, the U.S. produces the largest share of total world manufacturing, not China. So, who's economy has been all hollowed out and is on the verge of collapse? Not ours.